Detroit's top farm club was back in Kansas City and the Central Hockey League for the second straight season. The Kansas City Red Wings, formerly the Kansas City Blues, played their home games at Kemper Arena, which held 16,031 fans. Larry Wilson, former Detroit Red Wing, returned behind the bench. Ted Lindsay doubled as GM in both Detroit and Kansas City. The KC Wings were coming off a 33-40-3 fifth place season in 1977-78, missing the playoffs. Wilson's bunch improved to 37-36-3, good enough for third place in the CHL. Their 77 points were 24 points behind league-best Salt Lake (that night's opponent) and seven ahead of fourth-place Fort Worth. 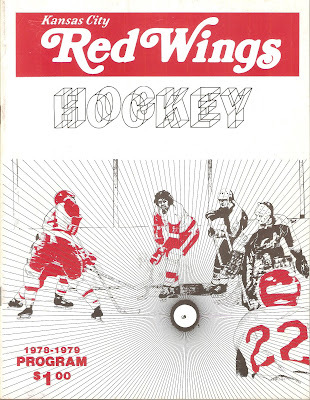 The Wings could score that year, lighting the lamp 301 times, third overall in the league. Mal Davis led the way with 42 goals and 66 point in 71 games. Two other players, Roland Cloutier and Jim Malazdrewicz, were the other Wings to score at least 30 goals that year. Four others scored at least 20. The defense struggled that year, allowing 306 goals, which was the third highest amount in the CHL. Kansas City used three different goaltenders. NHL veteran Ron Low led the way between the pipes in KC. Low, who was the odd-man-out when Detroit signed free agent Rogie Vachon that offseason, played in 63 games for Kansas City, going 30-28-2 with a 3.86 GAA and no shutouts. Larry Lozinski went 4-6-1 with a 3.92 GAA in 13 games, while Dave Johns made it into two games. The Kansas City Red Wings opened the Adams Cup Playoffs against the Dallas Black Hawks. Dallas finished 45-28-3 and in second place in the CHL that year, 16 points ahead of the Wings. The series was a mismatch, as Dallas swept the Wings aside in four straight. The Hawks would go on to win the Adams Cup in five games over Salt Lake. Another small program, just 35 pages, all black and white on glossy paper. The usual things are there, such as descriptions of infractions and rules of the game. There's also an article about "Women and Hockey", which claims that "Women and hockey go together like Simon and Garfunkle". Now, since Paul Simon wants nothing to do with Art Garfunkle, does that mean women want nothing to do with hockey? The article also notes how hockey's speed and action "will gratify and appeal to a female's senses" and gives women "a sense of security...belonging and exclusivity". Ooookay. There is a letter from Detroit owner Bruce Norris, a bio about Larry Wilson and an article about that night's opponent, the Salt Lake Golden Eagles. Local ads include Continental Hotel, Pete Franklin Chrysler-Plymouth, Jennie's Italian Restaurant and Lenny and Bert's Lounge. Aftermath: The Kansas City Red Wings, as of the date of this program, were averaging over 4,000 per game to Kemper Arena. However, Detroit pulled the plug on the franchise after the 1978-79 season and transferred their top farm club to Glenns Falls, New York, and the AHL for next season. Kansas City would later be home to the IHL's Kansas City Blades and UHL's Kansas City Outlaws.